I was trying to get the currency equivalent of the Euro to the US dollar. I can enter info into the phone but I can't figure out how to get it to display the figure. I have pressed every button and still can't get it to do anything. There are no instructions in the manual that I can find. You're not doing anything wrong. It's just that Tracfone didn't enter the exchange rates for all the currencies on the LG 420g like I think they have for some other phoness. 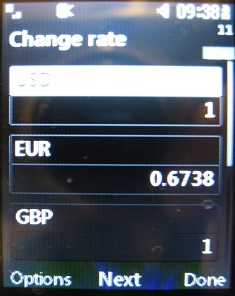 Therefore the currency rate for the USD to Euro is set to "1" which is why it appears that the converter is not working. This is the case for all the other currencies. You can easily fix this for the currencies you're interested in by simply selecting the rate option on the lower left and entering the current conversion rate. So for example I looked up the exchange rate and found 1 USD today is about 0.6738 EUR (I think that's the average this year according to google), so I entered that. 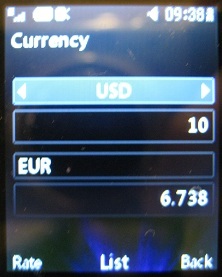 When I went back to the main converter screen and entered 10 USD, it displayed 6.738 EUR as expected. On my phone, you have to do this for every currency you're interested in converting because the default rate is just 1. As you notice, this will only give you approximate conversion rates unless you go to the trouble of updating them yourself every day.